The theme of the event was promotion of Sanskrit. It offered an encapsulation of the culture and heritage woven into Sanskrit. No wonder, the event attracted more than thousand samskrita premis or Sanskrit enthusiasts, who actively participated in the proceedings. As is well known, Samskrita Bharati with a missionary zeal, is engaged in popularising Sanskrit language and demonstrating to the world that Sanskrit cannot only be easily learnt by anyone but also by those who can easily speak in Sanskrit and transact daily activities too. Samskrita Bharati organises Samskrita Shibirams through which these concepts are popularised. Notable during the event was a seminar on "Why Samskrit". Dr. Chamu Krishna Shastry, Samskrita Bharati; Dr. Srinivas Varkhede, Karnataka Samskrit University; Dr. Ramachandra Bhat, Veda Vignyana Gurukulam; Dr. Balachandra Rao, mathematecian and astrophysicist; Dr. VR Anil Kumar, Kalpa Heritage Trust; and Uttara Nerurkar, Vedic scholar, were the expert speakers. Additionally, an exhibition was also organised. Here, there was a stall on "Samskrita Wikipedia" (Sa.Wikipedia). This was a grand attraction for visitors as Sanskrit Wikipedia showed that (Sanskrit) knowledge can be accessed in a split second with a click on a computer. 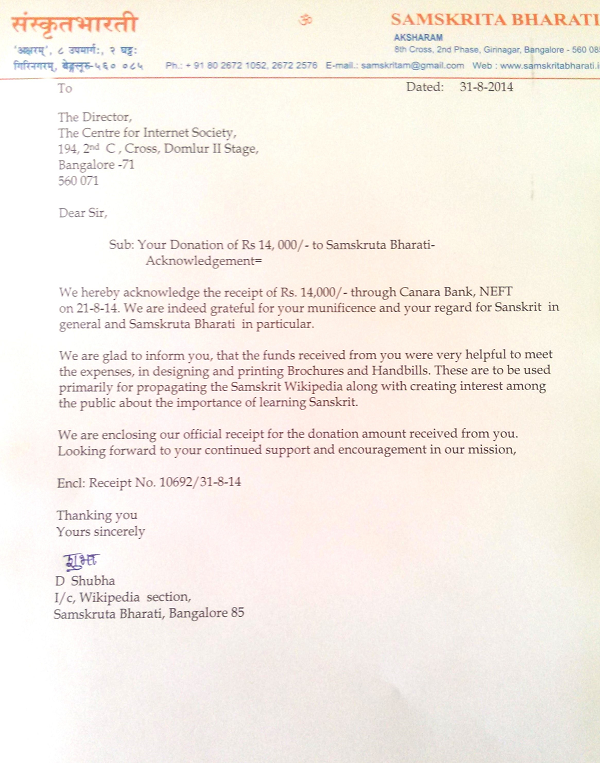 The Sanskrit Wikipedia wing of Samskrita Bharati is thankful for the timely support from CIS-A2K, which was used for designing and printing handbills and brochures about Sanskrit Wikipedia. The brochures, which were distributed among participants, were well appreciated as it helped them connect with Sa.Wikipedia, and the myriad possibilities available to them by learning Sanskrit. The entire event was of great significance in the promotion of Sanskrit language. This article was written by Shubha and Sayant Mahato.